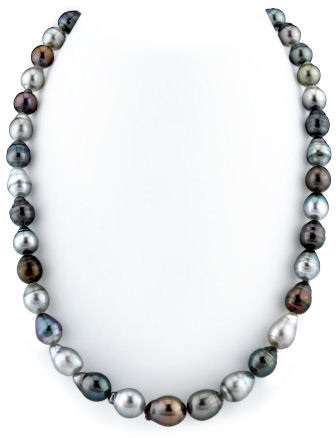 This necklace is one of the most unique combination's of multicolor pearls offered within our Tahitian pearl category. The strand includes beautiful Tahitian baroque pearls, ranging in size, color, and shape. This Tahitian pearl necklace measures in at 8mm in the back and graduates perfectly to a gorgeous 10mm centerpiece. All pieces in this black pearl necklace are AA+ quality with high luster. We guarantee our 8-10mm Tahitian South Sea Multicolor Baroque Pearl Necklace to be high quality, authentic jewelry, as described above.